Joy Creek Photo Archive (c) all rights reserved This seedling was spotted in our gardens by Marietta O'Byrne from Northwest Garden Nursery. She noticed that its flowers were more violet blue and not the maroon of the form generally seen in gardens in our area. At her suggestion, we have propagated the plant. 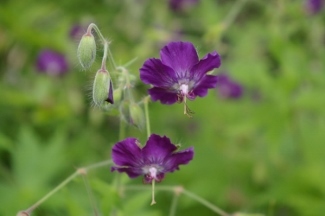 We have learned to cut Geranium phaeum and its selections back fairly hard after the spring bloom. This promotes new growth which remains attractive for the rest of the season.